First, prep the vegetables: dice the onions, shallots and garlic; slice the eggplant, tomato and zucchini about 1/8 of an inch thin; and chop the terragon and oregano. Heat ¼ cup + 2 tablespoons of olive oil in a large pan over medium-high heat. Throw the onions in there with a little salt and pepper and stir for 10 minutes. Add in the garlic and oregano, cook for another 2 minutes, and take it off the fire. 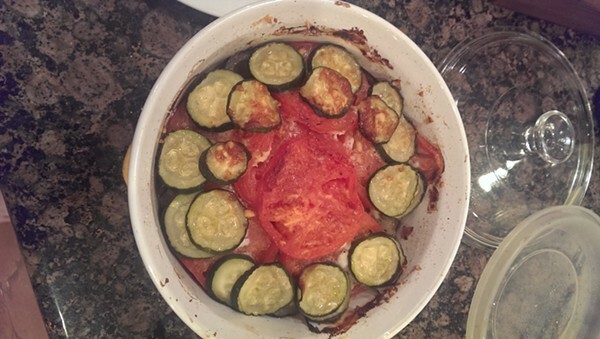 Get a large casserole dish or soufflé dish or some big dish that won't explode if it's in an oven and layer the bottom with the eggplant slices. Add a little salt, then top with a ninth (yeah yeah, it's oddly specific, just eyeball it) of the onion mixture and a sprinkle of cheese. You want to save about a fourth of a cup of cheese for the top, so again, just eyeball it as best you can. It's cheese; as long as it's in there somewhere, you're pretty much golden. 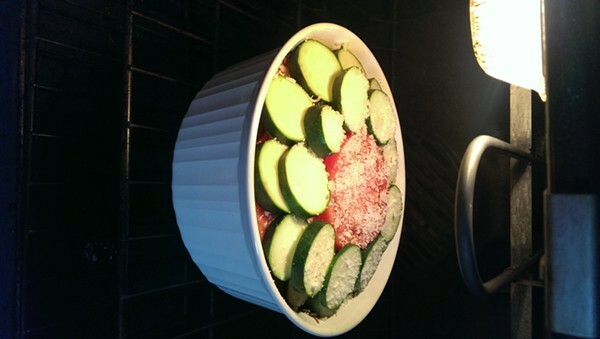 Do the same with the tomato slices, then the zucchini, and repeat until you've used up all the veggies. You should have 9 layers (see? Knowing fractions does pay off), and drizzle the top with olive oil. Sprinkle the rest of the cheese on top, too. Throw it in the oven for 40 to 50 minutes, until everything on the top is all golden and lovely, and start in on your béarnaise. Unless you like breaking your damn wrist from whisking for an hour and a half, just get yourself a blender. It's way easier, even if it's not "authentic," whatever the hell that means. I'm pretty sure it's just an adjective Panera uses to describe soups now. Heat a pan to medium-high, and throw the tarragon, shallots, vinegar and wine in there. Get it up to a simmer, and cook until the liquid's reduced by half, about 5 minutes or so. Take it off heat once it's reduced enough. Add the stuff from the pan, the egg yolks, and the dijon into the blender and blend together. SLOWLY pour a third of the butter into the blender, and set it to run as slow as possible. You want smoothness here, take it slow. Turn the blender to high, add the rest of the butter, and blend. Add a little salt and pepper and pulse it one more time to mix in. I guess the whole feel-goodsy moral here is this: don't get antsy just because your menu doesn't go according to plan. Yes, the people sitting at your table practically ignored the lobster tail you slaved over for six hours in favor of the vegetables you just made in a sixth of the time, but so what? You made it for them, not for you. Sides need their day in the sun too, dammit. See you next time, eaters.